Tratak is an exercise in which sight is fixed on particular object. 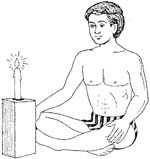 Sit in the ‘Sukhasana’ position. Place a burning candle or a small picture or a black dot at a distance of one and a half or two feet away from the face. Look at that object without straining the eyes. Hold back the winking of the eyes. When the eyes are tired or they shed water, shut them and imagine the picture of that object. Open the eyes after some time and practice tratak again. Do this exercise four to five times. If tratak is not performed properly, the eyes may be damaged. it is, therefore, necessary to practice this exercise under the guidance of an expert. If you practice tratak on the flame of a candle, sit at such a place as is not airy and is dark. Repetition: Everyday once or twice a day. Tratak strengthens the sight and the eyes become bright. Indirectly it has a beneficial effect on the brain and the mind. Simply think that if you don't know about Yoga and on the other hand I know a little bit about yoga than I can simply show you what little I know. We will do this by sharing our knowledge and if simple that if you know more about yoga than you are also a yoga teacher. When we give training for Yoga Teachers at our place than it’s totally with complete focus on you without any type of disturbance and daily distractions. If you are deeply interested in yoga than this is a great way to learn how to become a Yoga teacher. for how long you have to concentrate on the rock. i found yoga very effective exercise.